Functional Integrated Therapy™ is the first and only truly integrated approach to biomechanical therapy. It combines a comprehensive array of treatment modalities to address soft tissue, joint mechanics and nervous system activity. It has been proven effective in the treatment of many acute and chronic painful conditions. The FIT Institute offers a wide range of training programs for healthcare professionals, personal trainers and strength coaches. Our programs are designed to provide the advanced knowledge and practical skills needed to apply the FIT principles for improved patient/client outcomes. The FIT Institute offers high quality products for Health Care Professionals to help improve treatment outcomes. Patients can also benefit from a selection of products for personal use. How-to videos and other resources are available to help you with proper use of these products. Specially designed with a patented textured surface, large and mini sized models are available. The FAT-Tools are an exceptional aid to the treatment of all musculoskeletal conditions and improving motor function. Unlike other soft tissue treatment tools, they leave no bruising, while effectively loosening areas of tightness. 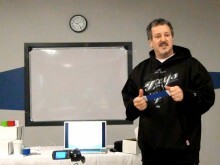 Check out the training tab to learn more about Fascial Abrasion Technique workshops for health care providers. A specially designed FAT-Tool model for personal trainers and strength coaches is available to assist in mobilizing tight tissues and help improve motor function. An easy to use simple design with the patented textured surface that makes loosening tight areas easy. A special FAT-Tool workshop ensures that you will be able to develop skills and confidence in effective use of the FAT-Tool with your clients. Great for athletes and non-athletes alike! The Fascial Abrasion Technique (FAT) Stick is extremely effective at loosening tight muscles and relieving post workout muscle soreness. It features the same patented textured surface as our professional grade FAT- Tools with an easy to use simple design. Synergy Performance Tape is the next generation in kinesiology tapes designed with a specially formulated adhesive that is more aggressive for active lifestyle individuals and serious athletes that require a tape with more performance. Videos, courses, and seminars for Personal use, Personal Trainers, Coaches, and Health Care Professionals are available to help you get the most out of our FIT Institute products.